Here is my map of Burr Farm Open Space Ride. I have the start point at Bramble Trail (though not really shown on the map). I used GPS Visualizer to make this map. This is a good ride that can be done in about an hour and provides a great mix of terrain. The trails are mostly single track riding, except for the rights of way (ROW). There is alot of climbing, crossing streams and riding through some really interest property. You can park at the Burr Farm Open Space Kiosk located at the top of Dinglebrook Road but from Bramble Trail its almost a seven mile ride. Going up Hawley Road is challenging because its an old right of way (ROW). The homeward leg, going down Lake George Rd, another ROW that is impassible to vehicle traffic. 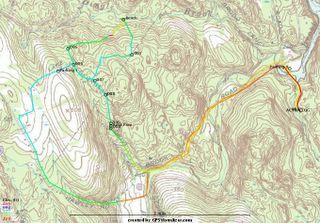 I plan more updates to this map because there are numerous trails coming off of the Open Space Trail (blue blazed) that have yet to be explored. 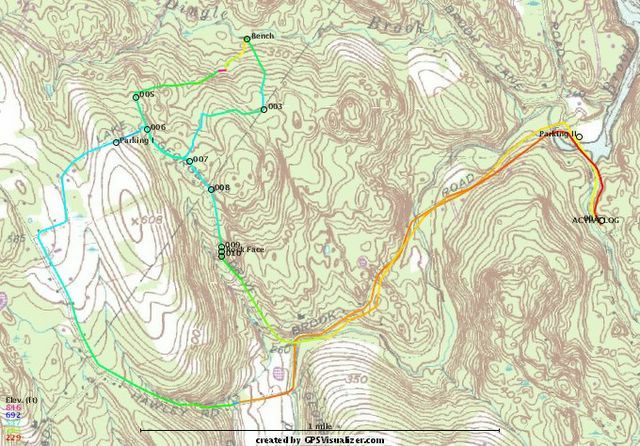 I hope to find a trail that connects the Newtown Forest Association property north of Pond Brook to this area which would make for some really good riding.